This past winter, preparing for the 2018 sampling season, we filled up the WSG Crab Team freezer with more than 500 lbs. of bait and were so excited at the end of the day when we finally got to exclaim, “HOLY MACKEREL!” That line never gets old. But our choice of a single bait type is not only about getting to make that joke. In fact, bait was one of the most heavily-debated topics at the launch of Crab Team, so we thought we’d share some of what we know, and some of what we think about why we use mackerel. Volunteer Debra Paros showing off a mackerel tail. Photo: Susan Mador. First off, like so many other facets of the Crab Team protocols, the number one consideration was to make the bait we used consistent over space and time. That is, we knew we wanted to pick one bait type and stick with it, so we put a lot of thought into it. If different sites use different baits, or we change our bait from year to year, that could make it difficult or impossible to tell if the changes in trap catch are because sites are different, or because one bait type is more attractive. What type of bait would be most effective? What type of bait would be most practical? Regarding the first question, If you ever want to break the ice with a fisherman or a crabber, ask them about what bait they think is best. Everyone has an opinion, and more often than not, it’s a STRONG opinion, about which bait is the best. Wars have been started over the question of bait selection – ok, maybe not quite that extreme, but it’s a question pros take very seriously. For a bait to be effective for Crab Team sampling, it should be both attractive to European green crab as our target species, but also broadly appealing to anything else living at the sites we sample. Because we are also trying to gather data on the ecological communities at these sites, we want to sample widely as many types of animal as we can. Cutting and pre-portioning the bait is an important step in getting the mackerel ready to use in the field. Photo: Allen Pleus. Crab Team also needs bait that is logistically practical for a long-term citizen science project. For instance, because we plan to trap for many years, we needed to select a bait that would be consistently available on demand. Herring was ruled out for this reason because stocks can fluctuate dramatically, causing price and availability to be unreliable. In addition, there are considerations related to volunteers working with the bait, which all of the Crab Team members will be familiar with, including obtaining, storing, and handling the bait. And of course, whatever we chose would have to be reasonably affordable. Some folks were even generous enough to offer us free bait, such as spawned-out salmon. As a program on a budget, this offer was tempting, but remember that, ideally, each serving of bait would be nearly identical. 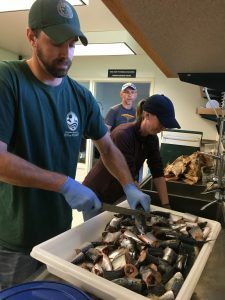 Salmon carcasses are large and require a lot of preparation to cut them down to that size, and it would be really onerous to figure out how to make every bait jar have the same parts of the salmon (what if the head is the tastiest part and that affects trap catch?). IN THIS CORNER, in the silver-blue trunks: The oil baron of the ocean, the iridescent ichthyoid! Hailing from a well-managed fishery in the western Pacific Ocean, weighing in at up to 3.5 lbs and stretching up to 14 inches tip to tail…it’s Scomber japonicus, the Pacific Mackerel! AND IN THE OPPOSING CORNER: The finest feast for felines, the preferred paté of purring pets! Now stocked at your grocery store, weighing in at 5.5 oz, and measuring 3 inches across…that’s right ladies and gents, it’s… caaaanned cat food! Crab Team debated the relative merits of both of these options for literally months. The big tradeoff was the ease of use for cat food: it can be stored without refrigeration, it’s already pre-portioned in a can so we don’t have to do any preparation, but it was universally panned by other researchers we queried as useless, ineffective bait. Ultimately, we discovered that it could also be hard to get a consistent, affordable supply of exactly the same recipe of the same brand cat food, in bulk, over multiple years, even working with a pet food distributor. Ultimately, we went with mackerel. Mackerel, being oily, is a fragrant, attractive bait for crabs. It can pretty reliably be purchased from local seafood distributors, and, in it’s frozen bait-quality form, is relatively inexpensive. We do have to invest additional time and storage on our end, to pre-portion the bait, and hopefully make it easier to handle for volunteers – or at least less unpleasant, but the same would be true of almost any non-cat food option we had in mind – so why not use the best? But our interest was piqued, was cat food that much worse as bait? Why not test it? We worked with a UW Program on the Environment Capstone student to test this question in 2015. We selected five sites around the Salish Sea, and set 20 traps at each for one night, 10 each of minnow and Fukui traps, and half of each group got cat food as bait and the other half got mackerel. 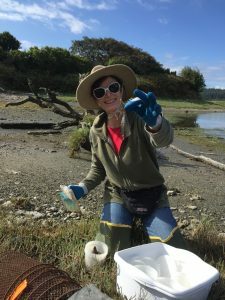 In 2015, no European green crab had been detected on Washington’s inland shorelines, which was only unfortunate for this experiment – we couldn’t really test which bait was more effective on green crab – but we could test it on native Salish Sea crabs, shrimps, and fishes. Interestingly, bait type only really made a difference in Fukui traps, not minnow traps. Minnow traps caught the same number or organisms, and the same number of species, regardless of whether cat food or mackerel was used. For Fukui traps, mackerel slightly outperformed cat food, but this finding wasn’t supported strongly by our data. Ever wondered what it’s like to prepare 200lbs of mackerel for monitoring? Check out this time lapse video to see the process in action. The following year Sean and I went to Willapa Bay to do the same experiment in an area we expected would have green crab, a better test of whether the bait is effective for green crab as our target species. Here we got a surprise! Overall, we caught many fewer organisms in traps at the two sites we tested in Willapa Bay than we did at any of the five sites we tested in Puget Sound. However, bait choice made a big difference: Traps with mackerel caught more organisms, and more different species, making it the clear winner. In addition, we only caught a few green crab, but every single green crab we did catch was in a trap baited with mackerel. What do we take from this? It’s possible that bait type only matters when there isn’t very much competition. That is, when you don’t have to face a bunch of other crabs and fish in a trap to get to the bait, maybe you can be choosy and pick your favorite. It was hard to say from our experiment that green crab conclusively preferred mackerel to cat food, but we had enough evidence to suggest that, even if we were uncertain, we had erred on the side of caution in choosing mackerel as bait. It might not make a difference in every situation, but when it does, mackerel always won out. We very much appreciate Crab Team volunteers braving the monthly mackerel mess. Several folks have come up with clever tips and tricks on how to make working with it more tolerable. Even if it might not be your favorite bait, it might just be the crabs’ catch of the day!